Latest LED Technology for the GB-4000! high power, LED photon light therapy machine. 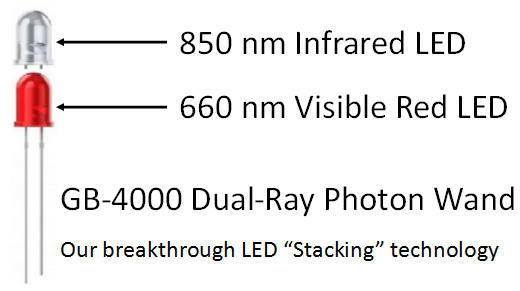 New 660 nm (visible red) and 850 nm (infrared) LEDs for greater power and penetration. This is a true breakthrough for GB-4000 users. 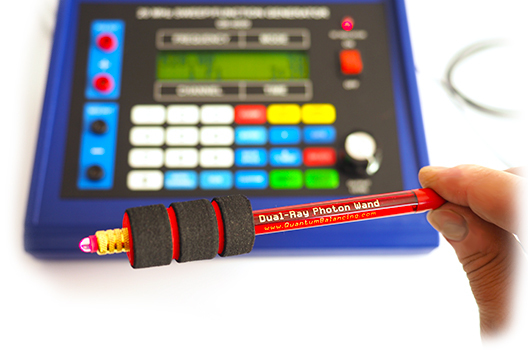 Our new 2017 GB-4000 Dual-Ray Photon Wand contains TWO LEDS in a unique "stacked" array. 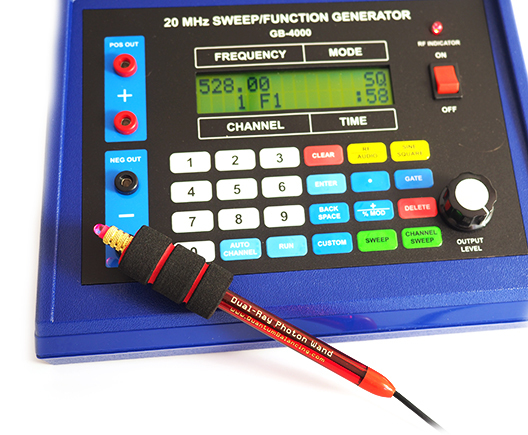 Never before has this breakthrough technology been available for an RF Frequency Generator such as the GB-4000. 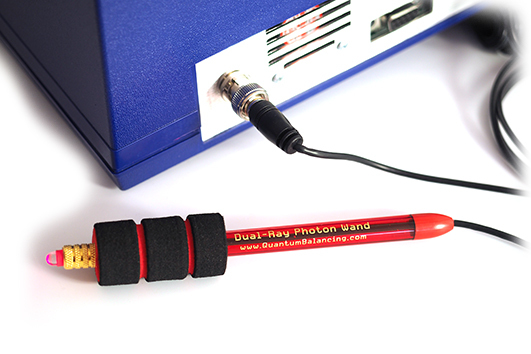 In addition to applying the GB-4000 frequencies and Auto-Channel Programs in the conventional way of using stainless steel cylinders and plates, now you can apply and pulse your favorite frequencies directly through the GB-4000 Dual-Ray Photon Wand which opens up a whole new world of possibilities. Our exclusive propriatery design - only available here! The GB-4000 Dual-Ray Photon Wand plugs directly into the BNC Output Jack on the rear of the GB-4000 and is designed exclusively for this instrument. Simply plug the GB-4000 Dual-Ray Photon Wand into the BNC output jack on the rear of the GB-4000. Make sure that the GB-4000 is in RF Mode. Select your frequency, adjust the intensity, and run. 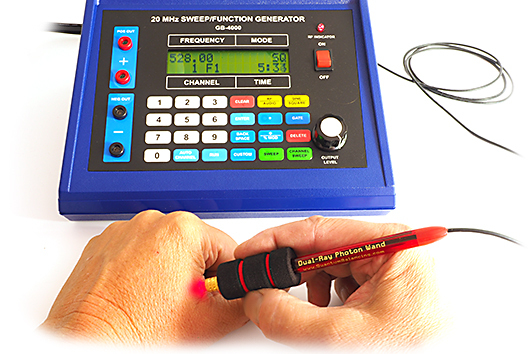 Watch as the frequencies are pulsed through the new 660 nm (visible red) and 850 nm (infrared) DUAL LEDS. Many advanced light therapy systems cost more than $2,000, but now you can increase the versatility of your frequency generator and match the capability of expensive commercial systems for a very reasonable cost. About eighteen years ago, researchers at the University of Chicago discovered that the average wavelength of cell tissue in the human body ranged between 600 nm and 720 nm. We believe that 660 nm visible red and 850 nm infrared seem to create a strong sympathetic vibratory resonance in the human body cell range discovered by research at the University of Chicago and works very well because it is in the range of the resonant frequency of cell tissue and seems to absorb better in hemoglobin. As you move toward the red end of the color spectrum, the rate of cellular regeneration increases. For instance, a single frequency in the green range of the color spectrum might affect the kidneys 40 times better than a normal base-line study, whereas a red range would be about 4,000 times faster. Over the years, researchers migrated to infrared, red and eventually the 660 nm wavelength because it was found to be the fastest way to regenerate tissue. So if you have an injury you would normally recover from in ten days, you may actually recover that tissue in two days by application of 660 nm red light. Now, it has been discovered that by combining the visible 660 nm red light with infrared (IR) 850 nm light wavelengths, the process becomes exponentially more effective. Researchers also found that irradiating mitochondria with red and infrared light causes them to produce cytochromes, which increase their efficiency. Our exclusive design, only available here! COMPARE AT $300 - $600! 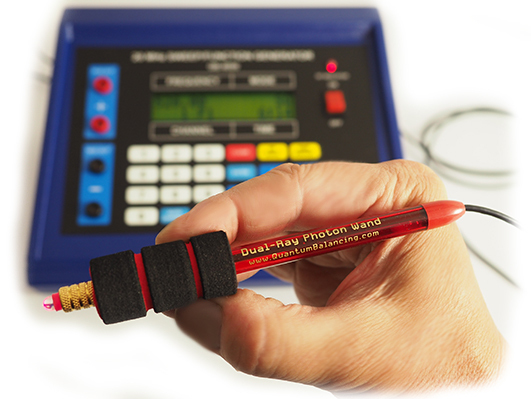 NOTE: If you have previously purchased a GB-4000 and SR-4 Package from us and would like to purchase the new 2018 GB-4000 Dual-Ray Photon Wand, please call us at (800) 435-1392 to arrange for a special discounted loyalty price. Copyright © 1996-2018 EMR Labs, LLC. All rights reserved.